The 2018 effort from Pétrus may be a new benchmark. Finishing up my rota of visits, I concluded my annual rounds in Pomerol. I started with Hélène Garcin-Lévêque who, along with her husband, Patrice, handles a few small estates. Clos l'Église, neighboring L'Église Clinet and boasting Cabernet Franc vines planted prior to the devastating 1956 frost, is just 14.5 acres. The 2018 L'Église Pomerol is loaded with intense raspberry and cherry compote flavors, with a good tug of tobacco through the finish, though it's fresh and polished overall. The couple, whom I first met in Argentina over a decade ago working on their Poesia Malbec, has embraced the pure, unadorned style that has gained momentum in neighboring St.-Emilion, and their 2018 Château d'Arce Castillon Côtes de Bordeaux is a textbook example, offering a fresh and floral feel within a lithe frame. Their Château Barde-Haut St.-Emilion is always a delightful and ageworthy value, and the 2018 offers a swath of dark cherry preserve laced with sanguine and alder threads. 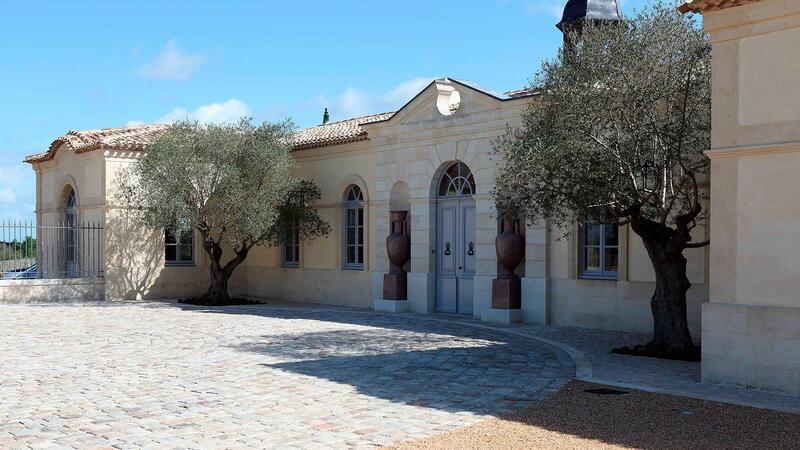 They've also renamed a recently purchased estate in St.-Emilion as Poesia. It sits atop the limestone plateau and offers the epitome of the superfine, mineral-driven profile that is this terroir's hallmark. Poesia's 25-acre vineyard had 17 acres recently replanted, and the wine is finally starting to come into its own. From there it was a stone's throw to Pétrus, an estate which most readers are familiar with. It seems winemaker Olivier Berrouet has finally settled in here. He handled the vagaries of 2018 well, slowing down the vinification by moving less wine during remontage to avoid over-extraction from the small and thick-skinned berries. The 2018 Pétrus Pomerol is hands down the best Pétrus since the 2010, and may even top that benchmark—no small feat. It is an enormous and seemingly complete wine already, offering a dense and lush core of raspberry reduction that just won't quit as it moves along, supported by graphite girders that are deeply embedded in the finish. There are black tea and apple wood accents as well, but this is just an amazing torrent of fruit. Yields were a respectable 2.7 tons per acre here. Also of note is the drop of Cabernet Franc in the blend (1 percent). It rarely makes it in unless the vintage runs late to ripen it fully. The 2010 had 4 percent … draw your conclusions thusly. That drop of Cabernet Franc in Pétrus is an interesting clue to the vintage in Pomerol. One that was further expounded upon at neighboring Vieux Château Certan, which has a hefty 30 percent Cab Franc in the final blend, the rest Merlot. "Cabernet Franc was really needed this year," says Alexandre Thienpont. "The Merlot was so ripe, almost heavy. The Merlot was like a mountain—huge, but with peaks and valleys. The Cabernet Franc was the filler, to round off and fill in," he adds, gesturing with his finger to show a jagged up and down line before moving it in a gentle wavy line left to right. Even with just 30 percent in the blend, the just-drawn cask sample of the 2018 Vieux Château Certan Pomerol starts off similar to a Loire red: crisp and superfresh, with high-pitched red fruit and a notable tobacco leaf aspect. We switch to the Le Pin (more on that in a minute) before returning to the VCC after about 15 minutes. Presto change-o, it's a new wine, fleshed out and dark, with a stunning violet aroma and a large core of pure cassis that cascades over a loam note on the finish. "This was a vintage where you could get a green character because it was so dry," says Alexandre's son Guillaume. "So we did a little leaf-pulling on the morning side to give the fruit some more ripening." In addition, the exacting Thienponts pounced on their anti-mildew spray program (with a conventional rather than organic treatment) just before and following the flowering. 2.9 tons per acre is the result, a normal-sized crop. As for the Le Pin, it's going to provide a sensational yin to Pétrus' yang. Le Pin is situated on gravel, Pétrus on clay. On the surface, clay would be the favored soil in a dry year, thanks to its water-retaining qualities, but the water table at Le Pin isn't that deep, and the rainy spring gave the vineyard enough reserve. A pure Merlot, the 2018 Château Le Pin Pomerol is aged in 100 percent new oak (vs. Petrus' 50 percent), yet it doesn't show an oaky side. Instead, it has a very deep well of boysenberry reduction that forms its core, with a thick licorice band coursing through and a smoldering earth note on the finish. It's more backward than the Pétrus, and on a par with its 2010 as well. There's a reason I typically schedule these two visits back-to-back. The compare and contrast is always illuminating. In vintages as good as '18, it is downright enthralling. As I left VCC, I realized that the Right Bank apparently had a leg up on the Left Bank in handling the mildew of '18. It wasn't a function of conventional treatments versus organic versus biodynamic, as everyone had issues. Instead, there was the timing, as Nicolas Audebert pointed out while I was at Canon the day before. Audebert noted how the Right Bank's last wave of mildew was earlier than the Left's. In the Médoc, the final infestation came in July, just as the clusters were closing up, creating a major headache for growers. In addition, the Right Bank's estates are typically much smaller than the Médoc's, allowing growers who typically live on-site to react faster and treat the vineyard more quickly. My visit to VCC was followed by a quick drive into Libourne, where the office of Établissements Jean-Pierre Moueix front the quai, to taste through the lineup of wines with Christian Moueix. The usually poker-faced Moueix broke into a bright smile as he gave his thoughts on the vintage. "They are very complete already," he says of he wines. "A high level of tannins, but soft tannins, and so much fruit. There are some big Pomerols in '18. You might expect with so much sun that the Pomerols would be like '03 (a notoriously hot year that resulted in some off-kilter reds). But the key was temperatures, which were in the low 90s. We never got to 100 as we did in '03. The '18 reminds me of '90 and of course technically today we are so much better than we were back then. The Merlot was so, so good, and we finally reached full maturity on Cabernet Franc too." Moueix and winemaker Eric Murisasco tweaked the amount of new oak up from 40 to 50 percent on the top wines here, a sign of their robust nature. The result is a lineup of superb wines, from values such as the juicy, fruit-driven 2018 Château La Serre St.-Emilion and winey, inviting 2018 Château Plince Pomerol. A super savvy buy will be the 2018 Clos St.-Martin St.-Emilion, which has an intense beam of plum sauce and melted licorice flavors, yet maintains poise with its chalky minerality. The 2018 Clos La Madeleine St.-Emilion is the first vintage for this estate under full control of the Moueix team, and it shows harmony and finesse to its pure raspberry fruit, anise and apple wood notes; gone is the overtly toasty persona of previous vintages. The 2018 Château La Grave à Pomerol Pomerol is a dense, fleshy wine with a great tug of warm earth behind its wall of fruit. The 2018 Château Bourgneuf Pomerol is one of the tastiest and freshest examples of this wine in recent years. The 2018 Château Latour à Pomerol Pomerol is a polished, regal display of Merlot. At the top end, La Fleur-Pétrus and Trotanoy are among the elite wines in the vintage, while the 2018 Château Bélair-Monange St.-Emilion is the best vintage yet from this relatively newly created estate. Moueix is more than right to smile this en primeur season. To wrap up the day, I darted back over the border into neighboring St.-Emilion, where Cheval-Blanc looms as a potential monument to the vintage, thanks to ideally situated clay and gravel soils and a hefty dose of Cabernet Franc. Technical director Pierre-Oliver Clouet faced the same issues as the rest of Bordeaux: a rainy first half, with intense mildew pressure, followed by a dry and sunny second half of the vintage. "If you look at the chart [of temperatures and rainy periods], you would think we have a very, very ripe, showy wine, like '03 or '09," says Clouet. "But the reality is we have a very, very ripe wine that is still classically built." The window of harvest here was long, covering Sept. 10 to Oct. 11. Merlot was picked early, including older vines on clay soils that would normally be picked later. "The Merlot was terrific and it was ready early, because the clay had the water through the summer, so they never stopped ripening," explains Clouet. The Cabernet Franc and Sauvignon were picked later, with younger vines on gravel soils being the last picked. "They needed a little longer because they struggled a bit during the drought," he says. With a decent-size crop and high-quality grapes across the estate's 53 parcels, the selection for the grand vin is an eye-opening 74 percent of the yield, the most since 1993. The 2018 Château Cheval-Blanc St.-Emilion intense and sappy in feel, with very concentrated kirsch, cherry paste and plum reduction notes. Deeply layered, but with terrific drive thanks to its tannic spine, the finish delivers waves of smoldering tobacco and loam. All that and it comes off as fresh and creamy in feel, with a high level of pixelation that results in a seamless display of terrific detail. Perhaps it is fitting that I wound up tasting this blend of 54 percent Merlot, 40 percent Cabernet Franc and 6 percent Cabernet Sauvignon as the very end of my visits, as it just might be the wine of the vintage. Thanks for the reviews and hard work! Reading all of the blogs are helpful in understanding the Châteaus, vintage and ‘current’ release. All of the summary’s have been easy to follow except your thoughts on VCC. Would you mind elaborate on your thoughts on the 2018? Maybe I am missing it or reading into incorrectly but are you underwhelmed due to the added Franc, poor offering in 2018 or was it on par with the greats of Pen/Pertrua? Thanks in advance for further clarity. I was noting that the late ripening varieties - Cab Franc on the right bank and Petit Verdot on the left bank - played a larger than usual role in many blends. As the harvest was idyllic weather wise, these grapes came in in beautiful condition. And with yields lower, many producers used them to help top up production.